Seo - How to evidence a particular page on Google SERP? I noticed that some results of searching on Google are not a single url but a single url with a two-column list of what I call 'important links' of this website. 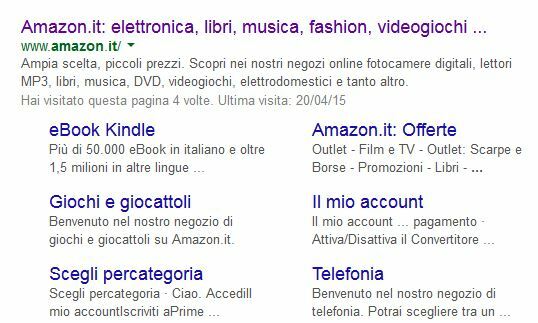 As you can see, some links are evidenced directly on SERP ("eBook Kindle", for example). I know I can produce a sitemap.xml for Google bot pleasure, but, my question is: How can I evidence some particular link of my website to be presented in this way in Google's SERP?. As far I know, there is no a special syntax in the sitemap protocol to 'force' or 'suggest' this to search engines. For future readers: this is the link to the sitemap protocol. It understands the structure of your website (typically via the structures in URLs). It trusts your website's content (no spam). The content/link is relevant and useful for the corresponding user query. Some say implementing breadcrumbs helps Google find SiteLinks candidates, but this has never been confirmed and may be completely false.